The Forum is a society at Bishops that was established in 1976 by Mr Michael Fisher, Head of French at the College from 1958. The society invites speakers after which discussion follows. Members of the Forum are entitled to wear a light blue Forum tie which was co-designed by the President Paul Murray and Arif Montsi, a former Chairman. 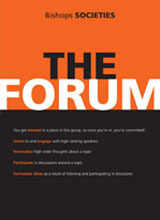 The logo is the Greek letter alpha for Agora which is Greek for Forum, a meeting place where discussion can take place. It is customary that at the end of the meeting the members are encouraged to enjoy refreshments and possibly further engage with the speaker on the topic. The Patron of Forum is Professor (Philip) Taffy Lloyd (OD) a distinguished Scientist and Nobel Prize Winner. The memberships stands at 15.